There’s a piece of La Rambla in Rockwell, Makati. LA Rambla, the Spanish poet, playwright and artist Federico Garcia Lorca rhapsodized, is “the only street in the world which I wish would never end.” Though not having explained what allure the place held over him, these are nonetheless big words coming from one of Spain’s preeminent avant-garde talents of the early 1900s — one of his plays was even set-designed by Salvador Dali (whom he romantically pursued, by the way). In any case, Garcia Lorca is not alone in his fascination with La Rambla; this central Barcelona landmark — a pedestrian street only 1.2 kilometers long — year after year draws a throng of tourists and locals to its sidewalk cafes, restaurants, kiosks, a palace, theaters and other historic buildings. There’s even a mosaic by Joan Miro on a part of its pavement. Not bad for a stretch that started out as a sewage stream. Certainly, as much an attraction at La Rambla as the pavement tiles — Barcelona is famous for its ornate baldosa — are the place’s numerous pubs. And, as seen in industry trends, beer — well-crafted beer, especially — is emerging as one of the more popular beverages indulged in at these places by locals and tourists alike. There’s a piece of La Rambla in Rockwell, Makati. 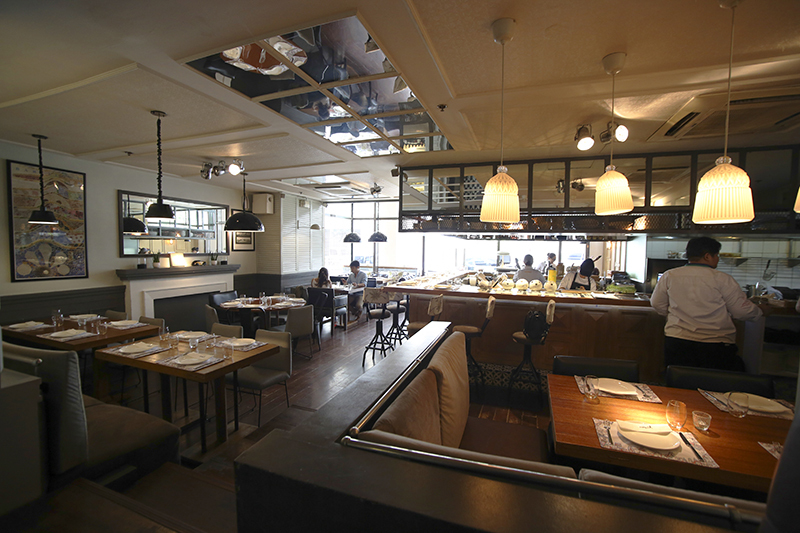 Fittingly named Rambla, this restaurant serving a good sampling of Spanish fare also literally brings Barcelona street culture to Manila by way of a piece of pavement tile, the same one seen on some sections of Barcelona’s streets. In Rambla though, the tile does not rest underfoot, but rather sits prominently on a shelf, and spotlighted for good measure. That it is treated as an artwork is only right; Barcelona tourism authorities encourage the city’s visitors to gaze downward at the sundry baldosa as they do skyward at Gaudi’s Sagrada Familia. 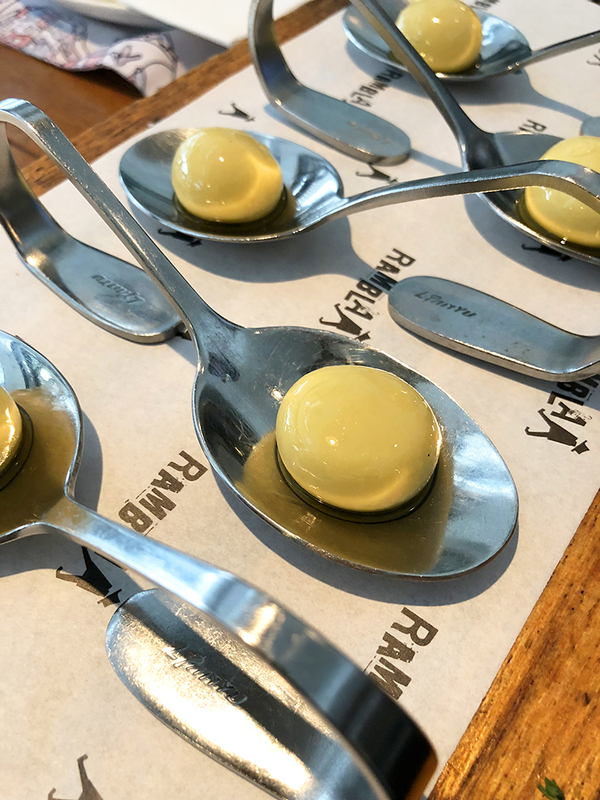 Rambla mixes together an upscale vibe without being stuffy; the sizeable bars on its ground and second floors guarantee this, with both filled with liquors and glasses and some sampling of tapas. A cook or two is always busy on a stove behind the main one downstairs. 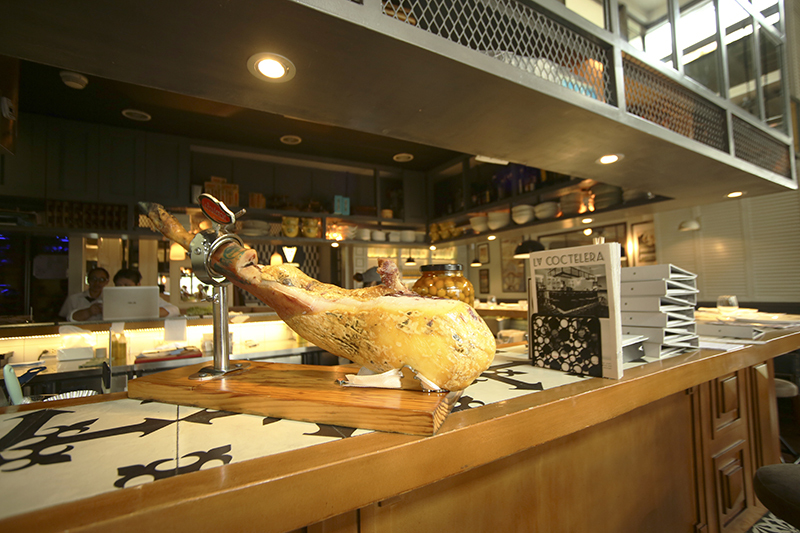 A slab of jamon Iberico sits on one corner of the bar top. The flurry of activities in the kitchen can be glimpsed from any bar perch, too. And further lending a casual ambiance are the dining tables outdoor, which can seat around 30. Add these to the 90 or so who can fit indoor, counting in bar seating, and Rambla can be comfortably lively. Obviously, the food served at Rambla is the main attraction. 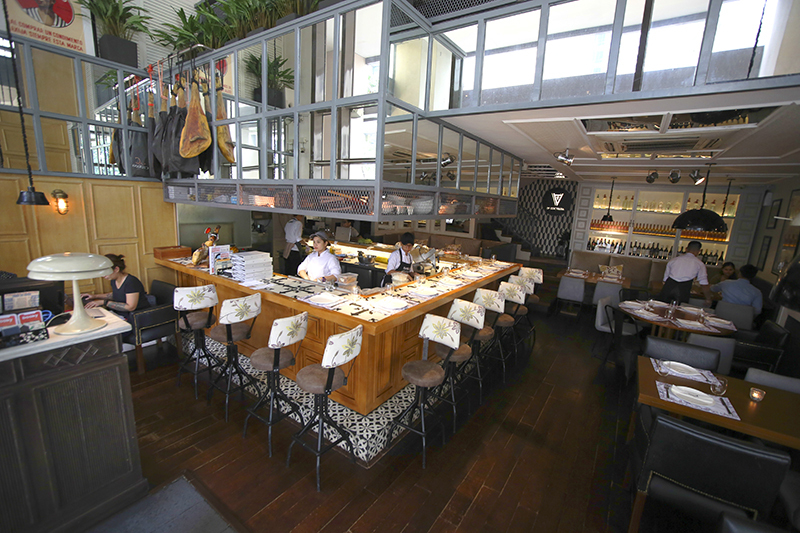 The restaurant has a relatively wide selection, covering tapas (of course) and fritos and other cheese and Iberico cold cuts, a few huevos dishes and some ensaladas, six kinds of paella (including one for vegetarians), pescados and carnes. And then there is always a menu for especiales. 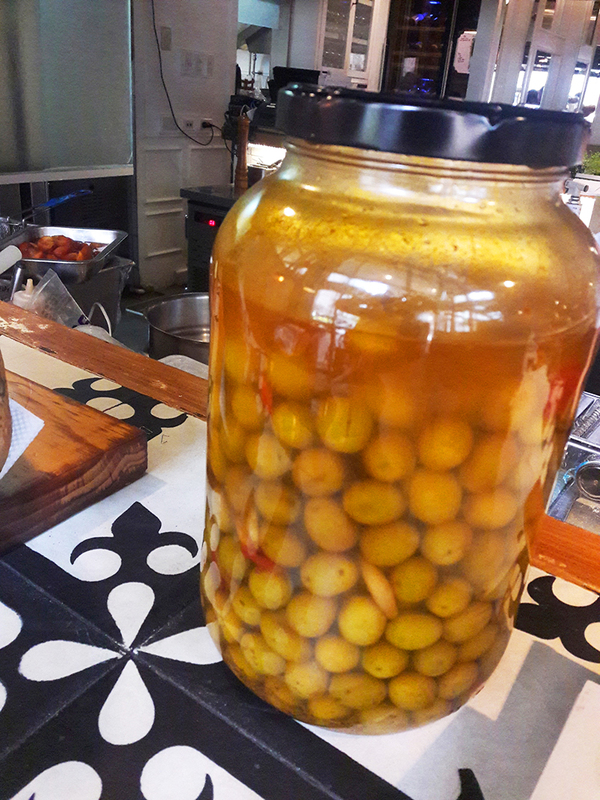 Some of the most popular tapas, the wait staff says, are the jamon Iberico, beef carpaccio, baby squid and large olives marinated in olive oil. Also always sought by patrons are the croquettes and calamares, the gambas y pollo paella, and the prime Angus beef cuts. Among the really great stuff are the cochenillo Segovian style and deep-fried bacalao. Some peculiar ones? How do tuna or salmon tartare with wasabi mayonnaise, or pineapple with foie, or mini pizza sound? Well, definitely not Spanish, indicating Rambla’s menu can get naughty. The drinks menu is huge, involving cocktails and other concoctions. 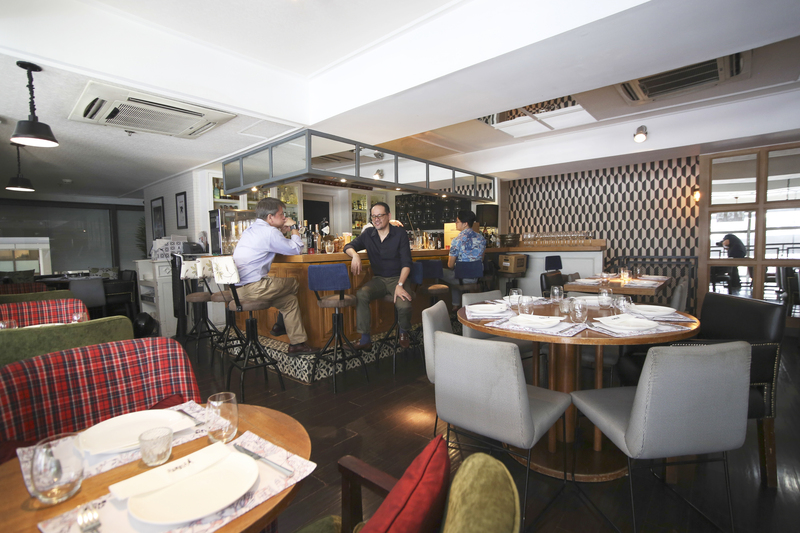 Fact is, Rambla has over the last five years or so been known as much for its selection of wine and spirits as it is with food. And, recently, the place has added craft beer to its list of libations. While other types of commercial beers are available, including Spanish ones like Estrella Galicia, the trio of new craft beers offered ties Rambla back to its namesake street. 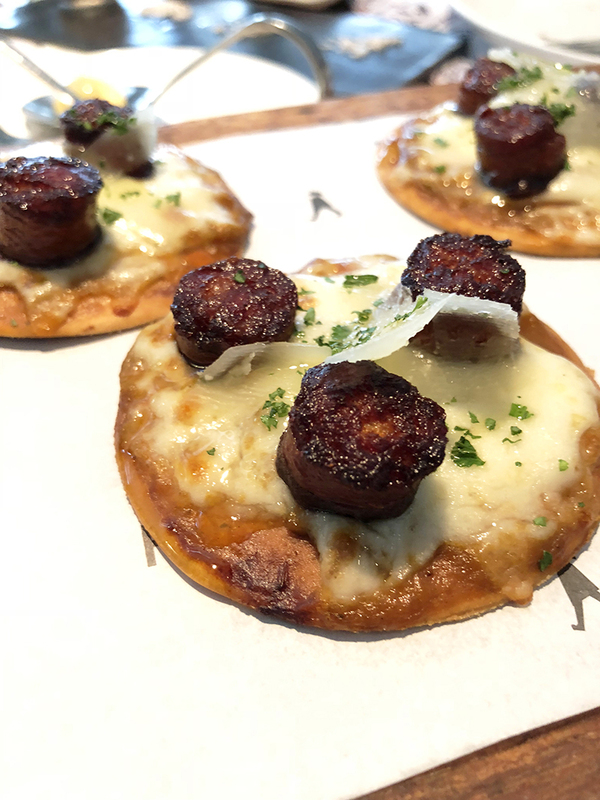 Simply, this is because the latest brews come from the Barcelona Beer Company, ensuring the flavor — if not the very spirit — these bring to Rambla is quite evocative of the old city. Now mix this with tapas (or any other good Spanish fare from the menu) and Barcelona décor, and the place becomes as good a place as any in which to celebrate the cerveza.